Come out and enjoy the last days of summer weather with your family at Spring Road Day on Saturday, September 15 from 11 a.m. to 2 p.m. This annual event presented by the Spring Road Business Association promises family-friendly fun featuring pony rides, a petting zoo, a Moon Jump bounce house, temporary tattoos and lots more! At Elmhurst Toyota, we appreciate the many family-friendly activities in our community and we hope you can attend with your kids. Wild Meadows Trace Park, located near the intersection of Spring Road and Prairie Path, is the beautiful setting for Spring Road Day. 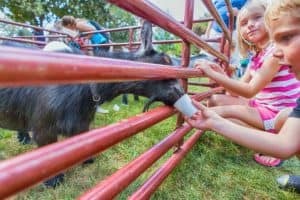 You can grab a bite to eat at the concession stands and listen to musical entertainment as your kids enjoy a pony ride or take their turn in the Moon Jump bounce house. The Elmhurst Fire Department and Police Departments will be there to give children the opportunity to see a real fire engine and police car up close. The Spring Road Business Association has offered year-round family activities for decades. The volunteer association was started by Elmhurst businesses way back in 1950 to promote local commerce and a strong sense of community. Among the ways the association carries out its mission is by holding free activities and events such as Spring Road Day for the public. The forecast calls for a warm, sunny day on Saturday, September 15. Why not bring your family, take lots of photos and make some memories during the last days of summer? We hope to see you there! September 15, 2018, 11 a.m. to 2 p.m.
Free. There is a cost for some activities.